It's been revealed that AKB48's Maeda Atsuko will be providing her song, "Kimi wa Boku da", as the theme for Katori Shingo's (SMAP) upcoming movie, 'LOVE Masao-kun ga Iku! '(Open in theaters on June 23rd). Maeda is an animal lover who owns 6 dogs and 3 cats at home. She expressed her joy saying, "I'm very happy to be involved with this warm movie about dogs." She also commented, "It's a movie that will make you both cry and laugh, so I want many people to watch it." 'LOVE Masao-kun ga Iku!' 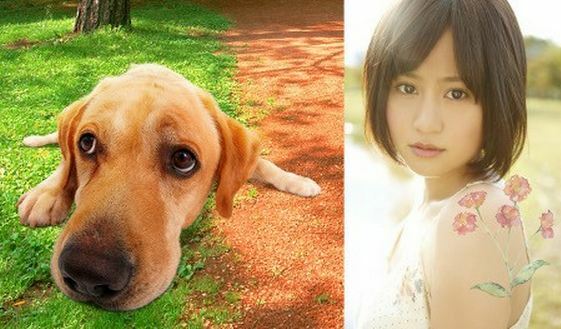 is based on true story of a Labrador Retriever named 'Masao' and talento Matsumoto Hideki, who made an appearance on a popular segment of TV Tokyo's program, 'Pet Daishugou! Pochi Tama'. Its story will revolve around Matsumoto (played by Katori), an unsuccessful comedian who is able to grow as a person after meeting Masao. Alongside Katori, the movie will star Hirosue Ryoko, Mitsuishi Ken, Narumi Riko, and Terajima Susumu. The theme song will be written by AKB48 producer Akimoto Yasushi. Although it's described as a love song, it perfectly suits the bond that ties Matsumoto and Masao together. Producer Ootani Kentaro explained, "It describes the LOVE and friendship of Masao-kun and Matsumoto-kun. When this song plays at the end of the movie, you will be moved by it 100 times more. Thank you for the best LOVE song." "Kimi wa Boku da" will be released as Maeda's second solo single on June 20th. According to Tower Records, the single will come in 3 editions, and each edition will include 2 coupling songs. One of those coupling song will be different for each 3 editions. Also check out the preview of "Kimi wa Boku da" as background music and the trailer for 'LOVE Masao-kun ga Iku!'�below! T-ara releases PV for "Lovey-Dovey"